Immunace is a specialist food supplement providing advanced nutritional support for all-round health and vitality, as well as specific nutrients for the normal function of your immune system. The Immunace formula has been developed in conjuction with international experts in nutrient research. 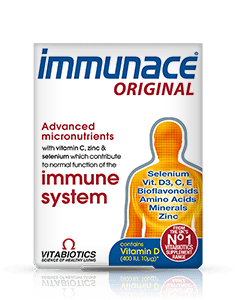 Immunace provides a comprehensive formula including Vitamin D, Zinc & Selenium which contribute to the normal function of the immune system, plus folate which contributes to normal blood formation. Immunace was one of the UK's first immune system supplements to pioneer and recognise that Vitamin D not only contributes to the maintenance of normal bones and muscle function, but also contributes to the normal function of the immune system. Immunace is available in the UK from larger Boots, Tesco, Superdrug, Waitrose, independent pharmacies, leading supermarkets, Holland & Barrett and health stores. Alternatively you can order online here. Vitamin C (Ascorbic Acid [Carrier: Hydroxypropylmethylcellulose]), Magnesium Hydroxide, Vitamin E (DL-Alpha Tocopheryl Acetate [Carriers: Silicon Dioxide, Purified Talc. ]), Bulking Agents: Dibasic Calcium Phosphate & Microcrystalline Cellulose, Citrus Bioflavonoids, Tablet Coating (Hydroxypropylmethylcellulose, Ethyl Cellulose, Propylene Glycol, Purified Talc, Natural Source Colours: Titanium Dioxide & Iron Oxides), L-Cysteine, L-Carnitine Tartrate, Zinc Sulphate, Polyvinylpyrrolidone, Thiamin (Vitamin B1 as Mononitrate), Niacin (Nicotinamide), Anti-Caking Agents: Purified Talc, Magnesium Stearate & Silicon Dioxide, Pantothenic Acid (as Calcium Salt), Ferrous Fumarate, Polyvinylpolypyrrolidone, Betacarotene (Carriers: Potato Starch, Water, Antioxidant: DL-Alpha Tocopherol), Vitamin B6 (Pyridoxine HCl), Manganese Sulphate, Vitamin A (Acetate [Carriers: Maltodextrin, Gum Acacia, Starch, Antioxidant: DL-Alpha Tocopherol]), Riboflavin, Ethyl Cellulose, Potato Starch, Vitamin B12 (Cyanocobalamin [Carrier: Dicalcium Phosphate]), Vitamin K1 (Carriers: Gum Acacia, Glucose Syrup, Tricalcium Phosphate), Copper Sulphate, Vitamin D3 (Cholecalciferol [Carriers: Medium Chain Triglycerides, Colloidal Silica, Purified Talc, Maltodextrin, Butylated Hydroxyanisole & Ethylcellulose]), Chromium Trichloride, Folic Acid (as Pteroylmonoglutamic Acid), Sodium Selenate, Potassium Iodide. ONE TABLET PER DAY WITH YOUR MAIN MEAL. Swallow with water or a cold drink. Not to be chewed. Do not exceed the recommended intake. Only to be taken on a full stomach. Can be continued for as long as required. Food supplements must not replace a varied and balanced diet and a healthy lifestyle. As with other food supplements, consult your doctor or pharmacist before using if you are under medical supervision, pregnant, breast-feeding, have epilepsy, haemochromatosis, a thyroid condition, suffer from food allergies, or are allergic to any of the ingredients. Made in a site that may handle nuts. As this product contains vitamin K, if you are taking anticoagulants do not take these tablets except on the advice of a doctor. This product contains iron, which if taken in excess, may be harmful to very young children. Why has Immunace been developed? When is Immunace recommended ? Can Immunace be used simultaneously with medications? How many tablets does one pack of Immunace contain? How and when should Immunace be used? Are there any undesired effects whilst taking Immunace ? "The best way to support the immune system is to maintain your general health with a balanced diet, mild exercise and sufficient sleep. Diet is probably the major factor in supporting the immune system." "I have been using Immunace Extra Protection for around 3 years. Can't recommend enough!" "I was recommended Immunace Extra Protection by a friend who has been using them for some time. I ordered 3 packs initially to split with my partner and only a few weeks in we are both feeling better already! Long may this continue! Just wanted to share some happy feedback with you, thank you so much!" "I have been using Immunace Extra for about 14 months now and is has certainly supported my immune system. I have recommended it to many friends. Thank you for this product." "I have been using Vitabiotics products for the past many years and I can confidently say I am both happy and satisfied with the results. Thank you "
"Hi, I just wanted to say how wonderful your products are. 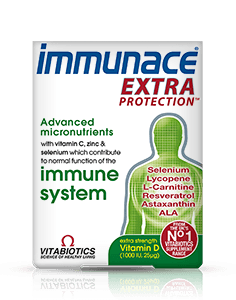 I have been taking Immunace for years and moved onto Immunace Extra Protection recently, which is brilliant. I have made my whole family take Immunace Extra Protection as I know how great it is. Thanks "
"I am writing to compliment you on your wonderful product. I take Immunace every day, and have been taking them since June 2010. Taking Immunace has really lifted my general health. I would like to say thank you for this product, it is brilliant and I can really feel the effect it has on my Immunace system." "I started to take a lot of vitamins and minerals, but after a while I got sick of taking over 20 various separate tablets of vitamins/minerals/herbs/oils a day. I started looking for a really good multivitamin as most do not contain 100% RDA of some vitamins. For me it was selenium I was mainly after, as my research and experience showed it to be a really important mineral and one of the best anti-oxidants to help maintain the immune system. I finally came across Immunace and couldn't believe the levels of ingredients it contained. Not only does it have an excellent 180 micrograms of Selenium it also contains Iodine (important for maintaining a healthy Thyroid gland), L-Carnitine (for metabolism) and Copper which I have never seen in any other multivitamin. My search is now over, I have found the best multivitamin on the market. Thank you for making Immunace!" "I have a hectic and chaotic schedule, with regular travel between the US, London, and other countries to give lectures and attend conferences. When I started taking Immunace two years ago on a daily basis, I could feel the difference it made after a week; I felt better all round and had more zip . When I ran out of Immunace recently, the difference was obvious after 10 days. Happily my travel plans included a trip to Vitabiotics to replenish my supplies. Louis G. Keith, M.D., Ph.D. Professor Emeritus The Feinberg School of Medicine Northwestern University, Chicago, Illinois, 60611 "
Always read the product directions before use. Do not exceed the recommended intake. As with other food supplements seek professional advice before using if you are pregnant, breastfeeding or suffer from food allergies, and consult your doctor or pharmacist if you have an underlying medical condition, or if on medication. Vitamin supplements are not intended to treat or prevent any disease. This product contains iron, which if taken in excess may be harmful to very young children. Food supplements must not replace a balanced and varied diet, and a healthy lifestyle. "Diet is probably the major factor in supporting the immune system."